Stellen Sie sich entspannen am frühen Morgen oder am Abend und nehmen in der Panorama Sonnenaufgang und Sonnenuntergang von all dem Balkon dieser 2. Stock ETW am Strand in Edgewater Beach Resort. Sich die Zeit - am Strand, Golf spielen, oder nehmen Sie an vielen der vielfältigen Aktivitäten dieses pretigious Complex zu bieten hat. Kostenloses Wi-Fi auch! Das Hotel liegt direkt am Strand! Schlafzimmer verfügt über ein Kingsize-Bett, große Schränke. Zwei Badezimmer mit WC und die Bequemlichkeit der Waschmaschine / Trockner in der Wohnung. Wohnzimmer verfügt über Queen-Schlafsofa, Zweisitzer, Esszimmer. Voll ausgestattete Küche. Vor kurzem renoviert. Komplex bietet 11 Schwimmbäder, 10 Plixicushion Tennisplätze, Whirlpools, Spielzimmer, Restaurant, Souvenirladen, kleinen Marktplatz, Pizzeria, Tiki Siebdruck, Splash Pad, Seilgarten, Par 3-9 Loch Golfplatz und eine Straßenbahn um Sie überall auf dem Grundstück zu erreichen. Alle Zimmer dieser schönen, zeitgemäßen Wohnung haben Strandblick mit Terrassentüren vom Wohnzimmer und Schlafzimmer zum Balkon. Im Herzen aller Panama City Beach zu bieten hat. Nur einen kurzen Spaziergang oder Fahrstrecke an alles. Kommen Sie und genießen! Sie wünschte, du könn Urlaub für immer! Einige unserer Lieblings-Restaurants in der Nähe gehören: Firefly, Wildschweinkopf, Mike's Diner, Wicked Wheel, Ananas Willie, Montego Bay, um nur einige zu nennen. PCB bietet Familienattraktionen wie: Zoo World, Gulf World, Wasserpark Shipwreck Island, Wonder Works, Minigolf, Wassersport, Fahrrad- und Bootsverleih und die Liste geht weiter und weiter. Most relaxing 10 day vacation ever! Clean. Beautiful Ocean front view. Bedroom needs to be a little cooler or redirect the air vent, it blows in the wrong direction but there was a fan. Could use an update with the decor. Loved the fact that we could see the ocean from our bedroom and the living room. Balcony was spacious along with the condo itself . Well stocked with kitchen supplies, extra bed linen, and towels. This could be the first bad review I have ever given. When we arrived at the room it hadn't been cleaned at all. The sheets and towels were in the floor. The owner called the cleaning crew and instead of bringing clean sheets, they put the sheets in the washer and were planning on waiting for the sheets and towels to wash and dry. This would have taken hours and interrupted our first entire night. We weren't reimbursed for anything and couldn't get in touch with the owners for the WIFI password and there were no instructions left about anything. It was a "work trip" for me so it made for many trips to the coffee shop instead of the room. Beach was wondef, edgwater is a great resort. We had a different room in edgwater our last three nights and it was FABULOUS! Room was clean, owner was attentive and ended our vacation on a positive note! Brad, I'm sorry for the condo not being cleaned on arrival. I was not aware that you were even going to rent it at the last minute due to the fact you did not answer my request for further information. You arrived and did not have the specific information I give each guest Before arrival such as parking pass, keys or door code, WiFi password, my additional contact numbers if not able to reach me on cell. As far as reimbursement for your trouble on this, you have not given me the chance to do this. I would be sending a check back to you but still do not have a mailing address for you. I try to keep all my guests happy and when I found out you were there without my knowledge, I immediately called to have it cleaned for you. 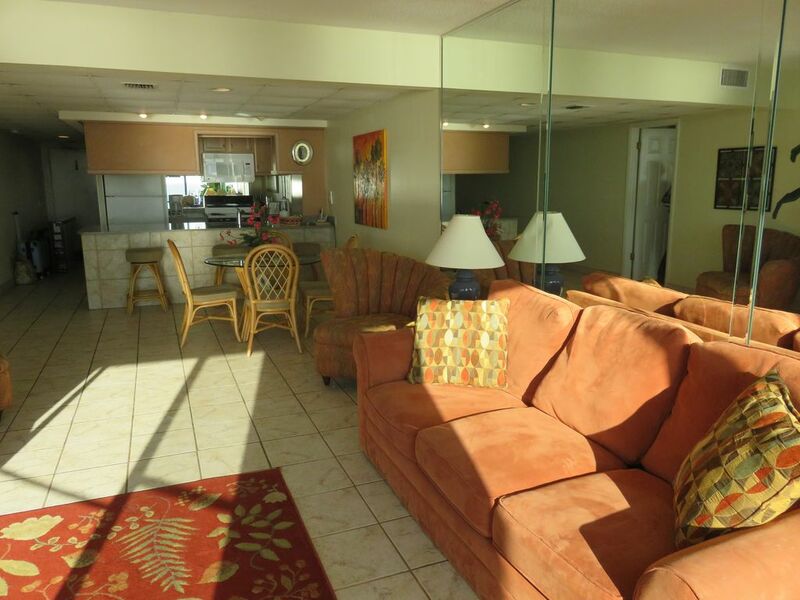 All of my other guests have been very satisfied and happy with my condo and the cleanliness and service I give them. I just got back from Leeward 205. I highly recommend this rental. This beach front condo was big enough for my husband, 2 kids, and myself. It felt like home. Being able to cook breakfast, lunch in dinner and never have to leave the beach. Sharon was great to rent from. She was easy to get in contact with and everything went smoothly. Thank you. You were great guests and I hope you'll keep us in mind for your next visit. We have the condo next door also so it's great for extra family or friends to rent both and be so close. I highly recommend this rental!! My wife, daughter and I loved the Condo. The Kitchen/Dining area was especially nice with the granite counter tops. We really enjoyed the large balcony with unobstructed views & comfortable furniture. You can see the beach and ocean from every part of the condo, through the huge floor to ceiling windows!! The two onsite restaurants were wonderful! The fried cheese cake at Oceans was incredible and so was the pizza from Paradise Pizza!! The weather and ocean didn't cooperate very well but with the onsite Lagoon pool and other pools, there is so many other things to do on site and the surrounding area. We particularly enjoyed the Sea Screamer Site Seeing Cruise around the PCB Bay and ocean front!! Thank you so much. With this condo with all the views from every room and the whole resort itself I find I have repeat guests year after year. I'm happy you were satisfied and enjoyed the condo and thank you for the input as I know travelers and future renters do read these comments. Retired couple - spent a week at the beach in October. We wanted something ocean front, not gardens, low enough to use the stairs and parking close so we didn't have to tote luggage and groceries a long distance. This condo met our criteria. Any problems we had were resolved quickly by Sharon. Even though I would give the view and location 5 stars, the condo itself gets 4 stars because the wall coverings, carpet, bathrooms etc are somewhat dated. The kitchen has been updated with newer cabinets, countertops and appliances. What a View!! Stop Looking this is the One! Gosh, where do i begin? The condo was fabulous, it had everything we could ever want or need. The beach was amazing. If we were any closer, we would have been in the ocean. When you rent from Sharon, (who BTW was wonderful) you get all the amedities of Edgewater...Pool and parking passes are included. We started our day at the beach, then migrated to the lagoon pool, grabbed the best coconut coladoa i have ever tasted then ate at the Oceans resturant. The resturant on the resort had the best shrimp po boy sandwich and the nachos were piled high. You get your monies worth and wont be disappointed- each plate can be easily shared. i loved this place. The location was perfect. stop looking and pick this one...you will love it! PS: Dont forget your Shade canaopy 10 x10...you can set it up right on the beach w/o paying for the Beach set up the resort offers...which can run you a steep 40.00 a day! We are so happy our guests enjoyed this condo. Edgewater Beach Resort does offer so many amenities you really don't have to leave and fight the traffic. Thank you again for this kind review. Gesamt-Resort-Konzept. Sie brauchen nicht zu gehen. Oder Sie können alle in der Nähe Restaurants, Sehenswürdigkeiten, Golf in der Nähe zugreifen usw. Resort verfügt über Friseur, Snack-Shop mit Geschenken und Notwendigkeiten, Starbucks Coffee in Snack-Shop, 9-Loch Par 3 Golfplatz Privat für Eigentümer und Gäste, 10 Becken mit einer großen Lagunen-Pool, Kinderspritzwasserbereich, Sky Trail (eine Mini-Kletter / Zip Line), Whirlpools, Oceans Restaurant mit Innen- und Außenbereich, Getränkespezialitäten und Great Food! Rates are subject to change until confirmed. No Pets. No Smoking. No single under age 25. Rates Do Not Include: parking fee, end of stay cleaning or sales tax. Insurance is optional. All forms of credit and debit cards accepted and Money Order or Cashier's check. Payment must be in full 3 weeks prior to arrival.